I have been incredibly busy with my Japanese cinema class in Tokyo, so sorry for the lack of updates. I did want to write about the memorial service for Tsuchimoto Noriaki last Saturday. We arrived early at the Josui Kaikan in Jinbocho because my wife had been asked to help at the reception desk. And then more and more people arrived. In the end, the hall was packed with about 500 people and many had to stand. (See the photo in the lobby below.) Pretty much everyone in the documentary, and many in the fiction film world was there. It was a nice service. Tsuchimoto's daughter showed photos of his last days, staff members like Otsu Koshiro talked about his work, and his elder sister made everyone laugh by kindly suggesting that there might have been a little exaggeration here and there in his description of their childhood life. Hani Susumu gave the toast at the end. At the event, they were selling copies of Tsuchimoto's last book, Dokyumentari no umi e, which is a thick interview book done with Ishizaka Kenji. Chock full of pictures and information, it is a must for anyone who wants to know about postwar Japanese film. I will be taking my class to Kamakura on Thursday, so I ventured down there with my family yesterday to check on a few things. My old colleague at Yokohama National University, Professor Yamada, kindly met us at Kita Kamakura Station and we ventured around in the intense heat. Being "eiga mania" in some respects, I usually visit the graves of old film people when I travel to such places to thank them for the great movies they gave us. Yesterday was no exception, and we got off at Kita Kamakura precisely to start with Engakuji. Most people know that is where the grave of Ozu Yasujiro is, but there are a lot of others interred there as well. Ozu's grave is on the right halfway up the side of the hill after the stairs to the Okane and before you reach the Somu Honbu. But Kinoshita Keisuke's is about 4 meters away from Ozu's, right where the stairs reach that level. In a separate section, inside the Shoreiin, there are also the graves of the actors Tanaka Kinuyo and Sada Keiji. This temple is usually closed and we had to get special permission to enter. Tanaka's grave, complete with a bronze bust of her, was erected by her cousin, Kobayashi Masaki (director of Kwaidan, Harakiri, etc. ), and has his posthumous name inscribed on it even though it seems his main grave is in Shimonoseki (perhaps they divided his ashes?). Sada's grave is just a few feet away from Tanaka's and inscribed with his family name: Nakai (his son, Nakai Kiichi, is very active as an actor). On Thursday, I took my class to the Edo-Tokyo Museum, which is a nice introduction to Tokyo history in the last 400 years. 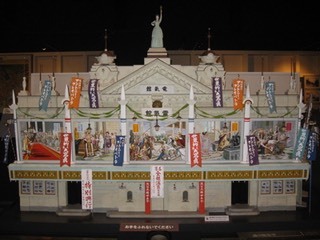 My main aim, however, was to show them the models of the river-side, temporary theaters in the Edo era, and the model of the Denkikan they have in their modern section (which also features a model of Ryounkaku, or "Twelve Stories," that reaches the ceiling). I had shown them where the Denkikan used to be in Asakusa, but it was nice to show them what it looked like in the mid-1910s. The colorful painted scenes from the movies showing, the excessive decoration, the statue on top--all communicate the cacophony of stimuli that was the thrill of Asakusa, while also rendering it out of this world. The model shows it when it was showing Marcantonio e Cleopatra, a 1913 Italian historical epic directed by Enrico Guazzoni that was a big hit in Japan. 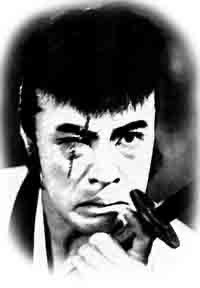 Somei Saburo, the great benshi at the Denkikan, made a name for himself narrating this film. I took my class to Yasukuni Shrine on Tuesday, but while we were in the Yushukan, I noticed that they were showing an animated film directed by Miike Takeshi entitled Heiwa e no ukei (A Vow for Peace). Searching on the net, it seems that while a DVD is available, about the only place it is being sold is Yasukuni. One should be suspicious of anything at Yasukuni (the controversial shrine celebrating Japan's soldiers, including its war criminals) as well as at the Yushukan (their museum celebrating the sacrifices of Japanese soldiers but failing to mention who they killed). One should also beware of their definition of "peace", since in most cases it is merely rhetoric justifying the pursuit of war. But I do wonder what kind of film this is. I found one right-wing blog praising it, but little else. I didn't have time to watch it (even though it is a little under an hour), and I don't like spending money at Yasukuni, so I didn't buy the DVD. It is apparently in two parts, one about the origins of the Yamaga Lantern festival, the other about Matsuo Keiu, who attacked Sydney Harbor in a midget submarine during WWII. I sent a post to KineJapan to see if anyone else knows about it. Continue reading Miike at Yasukuni? My summer class started this week and it has kept me busy. We went to Kabuki on Tuesday and saw versions of Izumi Kyoka's Demon Pond and the Saint of Mt. Koya, both supervised by Bando Tamasaburo (recalling of course Tamasaburo's appearance in Shinoda Masahiro's Yashagaike, though Tamasaburo only appeared in Koya hijiri this time). We had a special screening at the National Film Center on Wednesday, seeing A Page of Madness, Ito Daisuke's An Unforgettable Grudge (1926), and an M. Pathe film from 1908 The Tenth Act of Taikoki. It was interesting seeing some of the same kinds of techniques as A Page of Madness in Ito's film of the same year, helping confirm my sense that Kinugasa's work was less qualitatively than quantitatively different from its contemporaries. Today we went to Asakusa, which was quite busy with the Hozukiichi. But our aim was less "traditional" Asakusa, than the history of modern entertainment that was near its core. We of course went to Rokku, which used to be the movie theater capital of Japan, but with the Asakusa Toei and the Asakusa Toho gone, there are not many theaters left: just the Chuei Gekijo (foreign rep theater), Meigaza (old yakuza films)--see the intro to these two at Cinema Street--Asakusa Shingekijo (old Japanese films, mostly yakuza), and the Asakusa Seikaikan (old pink films). The Asakusa Toho building still has a sign up front saying "Bright and fun Toho movies!" But there are no such films there, only pachinko, as Toho has mostly abandoned its large urban halls for multiplexes (the Toho Koraku I saw in Kyoto is probably not long for this world). Much of Suwa-san's Hanasareru Gang was shot in Asakusa around 1984 in spots like Hanayashiki and the intersection behind where the Denkikan and the Tokyo Club used to be. The old movie district ironically--and perhaps appropriately--gave the film a Parisian and thus Godardian air. I was having lunch today with Kanai Katsu, and mentioned that I was going to the National Film Center to see Hanasareru Gang, a film that Suwa Nobuhiro, the director of such films as Duo, M/Other, and H-Story, had made in 1984 when he was still a student. The NFC is now doing a retrospective of the Pia Film Festival and is showing many of the award-winning 8mm films of directors who are now prominent in the film scene, such as Ishii Sogo, Nagasaki Shun'ichi, Ogata Akira, Inudo Isshin, Shiota Akihiko, etc. Well, when I mentioned that, Kanai-san said that he had taught Suwa-san when he was a student at Tokyo Zokei University, and that Suwa-san had recently become president of that university. "What?" I said, not believing my ears. A filmmaker just a bit older than me who is now president of one of the major arts universities in Japan? I remember having Suwa-san come to my class when I taught at Yokohama National University and comment on how hard it was to make a career out of making difficult films.